Hello! I am Erin and I blog over at Miss Crayola Creepy. I followed a sewalong for this slip and I am happy to say that this was the first sewalong I have successfully completed! 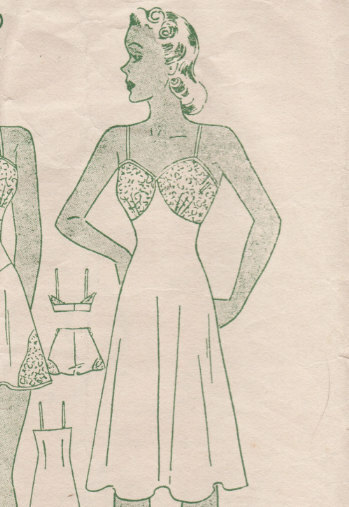 It was for the 1940s slip pictured above. I used a red cotton for the top portion and a blue with red polka dot flannel for the bottom portion. It’s really warm! Please forgive me, the nightgown looks crooked in this photo, but I just hung it at a weird angle. Oops. The back darts that you can barely see with all the wrinkles. Of course I couldn’t have done it without my sewing assistant, Stella! For more photos of my sewing (and cats!) please stop by my blog. Love the color combo and the polka dots!